Writing. Morning, noon and night, it seems. How I love to write. Within these deep layered walls the scent of a fragrance is mellow, lulling me with its charms, placating me, tugging at me to recall and remember. 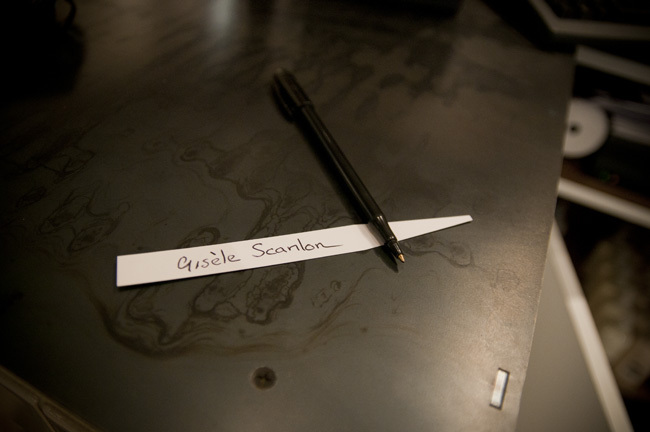 At other times, late in the evening especially, the fragrant notes are insistent and roll over me as I steady my pen to scrawl. I go on methodically working, letting the scent rest with me, a kind of invisible friendship, morning, noon and night. 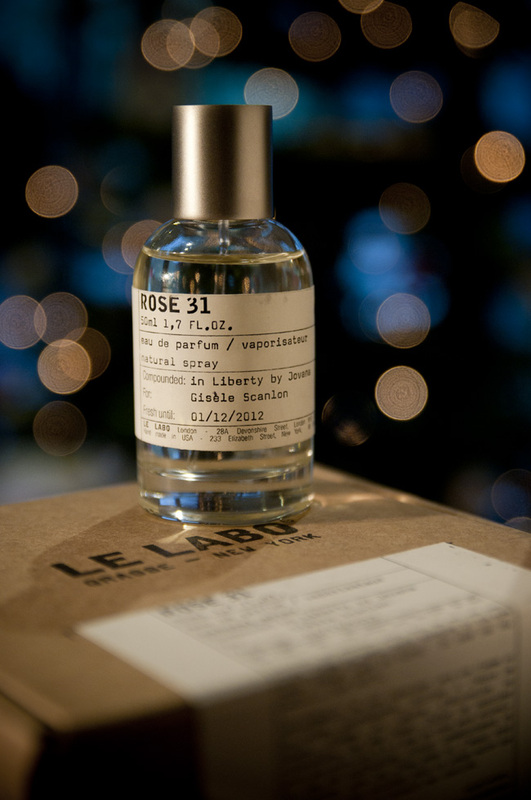 So now I wake with the singing birds, rearrange myself on the pillow and it greets me – Le Labo Rose 31, the first fragrance I had specially mixed for me several years ago for a reason that resolutely refuses to come to mind so I continue to order it. I should think because it reminds me of a country hedgerow tangled in tea roses. A decision was well and truly fixed in my mind in Liberty London when I first bought it. I love Liberty London’s leather goods and stationery and I don’t know why exactly but there was some shift and suddenly I decided to maybe give this fragrance a go. Having it mixed by a specialist would be a unique experience and the juice would last a year and seeing as Liberty London is my favorite London department store for all the world it seemed like the perfect idea. 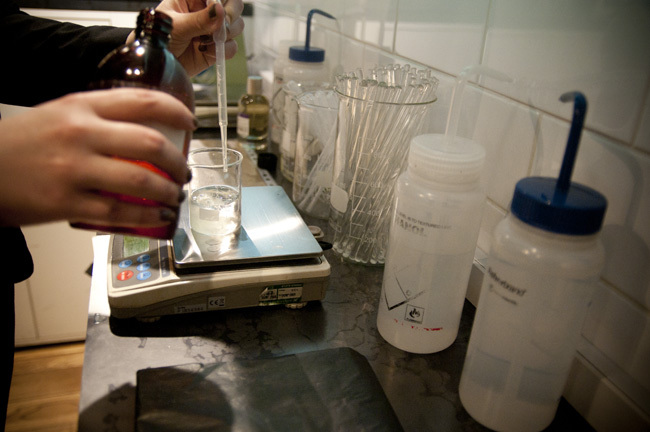 The air hummed with different perfume notes around Jovana Kalkan, master mixer at the Le Labo counter, some kind of alchamist trick obviously. I could have stayed there all day I expect and not have figured it out. I asked who Jovana’s customers were. “People who want a personalized fragrance with their name on it,” she said. “And people who want to make a secret statement through their perfume.” It had never before occurred to me that anyone might offer me this – a fragrance with my name on it. It seemed natural to go along with it – to not resist, so understandably I wondered if it might lead to something revolutionary. First she explained that the different fragrances came in three sizes. 50ml, 100ml (both juice) and a gel/balm stick which came in a tube not much bigger than a lipstick. She spritzed samples onto tester strips for me. I got an uncomfortable sense that my smell was being smothered as she turned the entire decision-making process over to me. I looked at but didn’t touch the rows of bottles. Flowers. Did I like flowers? I said yes but rarely as a fragrance, too pretty. I like dark, rich, rolling smells like a warm wild animal, curled up on an old leather chair, living in an abandoned library. Jovana said she understood and that Rose 31 would suit me, it was a man’s scent with a dark underbelly, but not too heavy. 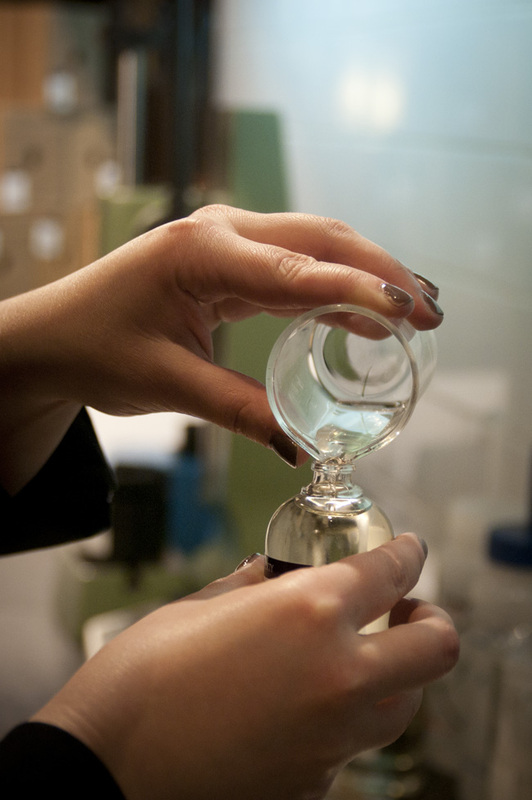 The fragrance notes are Grasse rose, pepper, olibanum, clove, cumin, nutmeg, cedar, amber, gaïac wood, oudh wood, and vetiver. I was charmed. 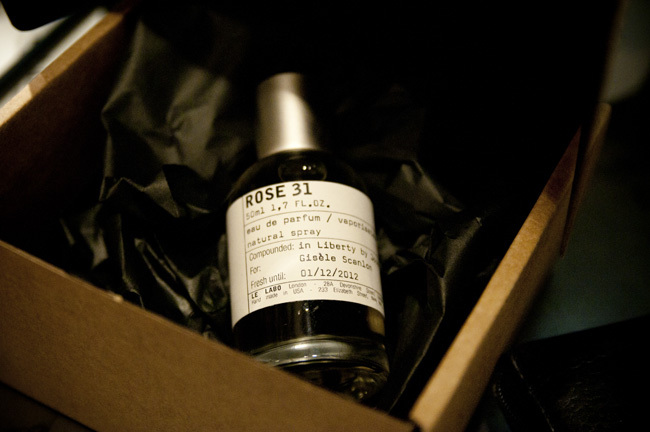 It naturally exuded a living fragrance on my woolen sleeves; Rose 31 was deep, dusty and dry, earthy, like I let my arms traipse through heavy undergrowth on a wet day in blooming woodland. Professor Trygg Engen, a professor of psychology at Brown University, found that people recall smells with 65 percent accuracy after a year and that olfactory recall is much more reliable than visual memory. I recalled the house I was raised in had an open half door, that’s true. The scent of the Irish countryside floated in; turf fire smoke, fox civet, horse sweat, wet grass, that’s true too, and butterflies and bees and birds sometimes. I wondered if I could pack all of that into a bottle? Those categories she explained were musks, leathers and woods. Wood she explained was a perfume category most popular for mens fragrance and I like the ingredient vetiver to this very day. Over time I’ve tried a vast number of vetiver scents and the one which I’ve found which suits me most is Sycomore from the Les Exclusifs line by Chanel. It’s a great big whopper of a bottle (200ml). I was curious. 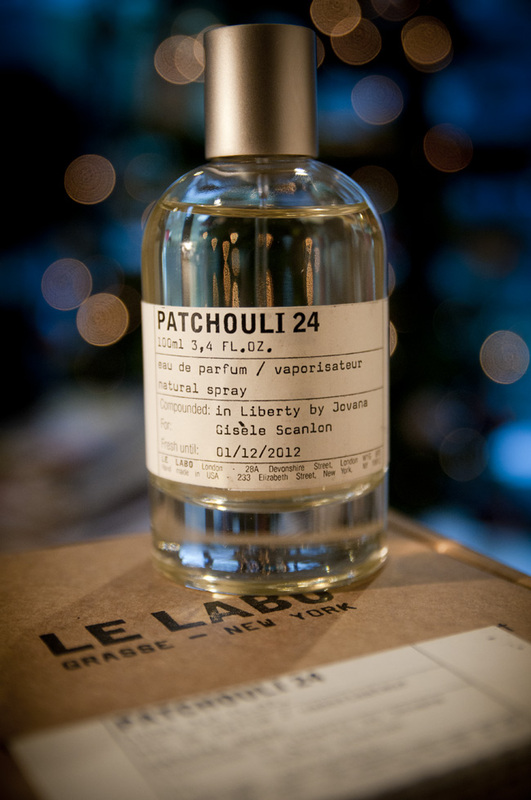 Jovana explained that the duo behind this French company Le Labo (Edouard Roschi and Fabrice Penot), wanted the customer to experience recall as much as possible so they created these lab-like boutiques in London, Los Angeles, Tokyo and New York plus a host of Le Labo “corners” all around the world like this one in Liberty London’s beauty hall. She also explained that she was specially trained to mix each scent in front of me. She then hand-poured and mixed the juice and sealed it all within full view. Of course I could have devised some recall game while Jovana went through all of this, but it was easy to notice that she was lost in the process. She asked that I write my name down (see above) so she could get the spelling correct on the customized bottle and box. (Both bottle and box can be labelled with a name or message of your choice.) I apologised for my chicken scrawl writing. I can’t recall what brought me to a different bottle on the counter. 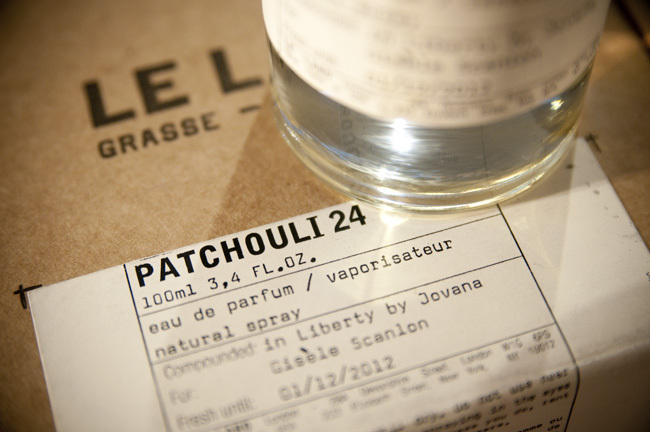 The mix was rare, leathery, smoky birch tar and soft vanilla and a little patchouli all in the one bottle. It had a bit in common with another fragrance I wear from the leather family of fragrances called Cuir de Russie by Chanel. 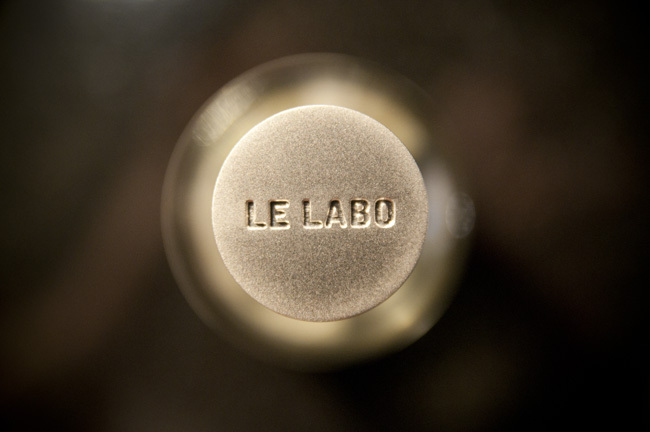 But this Le Labo leather smell was smokier and darker like charred wood and old leather car seats. And I guessed it would have long staying power on wool. I remember now, that’s right, I ordered a bottle. Later that evening (I was living in London at the time), I took the distinctive bottles from their brown boxes to sample and boxed them up again immediately. The secret to protecting fragrance is to keep it boxed up in the dark and away from sunlight (light breaks down the molecules). I wore these two fragrances for years and the fragrance and bottles were so distinctive. 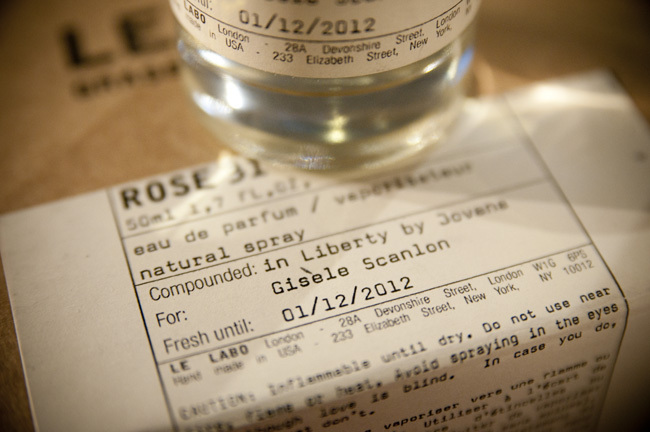 Recently I found the boxes and bottles in a linen drawer and what little fragrance was left was still potent. That shows you how lovely they were so I am utterly determined to reorder now, they have many stores dotted about the place. I have convinced myself that they were worth loving at the time and I could love again. ‘What is elegance? Soap and water!’ wrote Cecil Beaton. 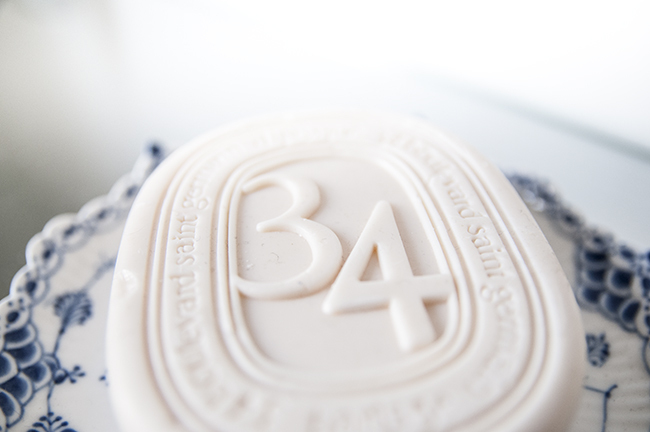 I agree with just soap and water and use 34 Boulevard Saint Germain by Diptyque Paris soap every day. 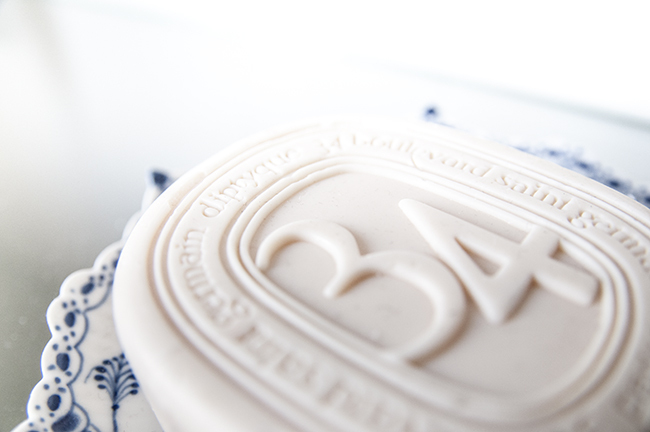 Sometimes I use a bath oil for a long soak but it’s generally just this beautiful soap (and water). 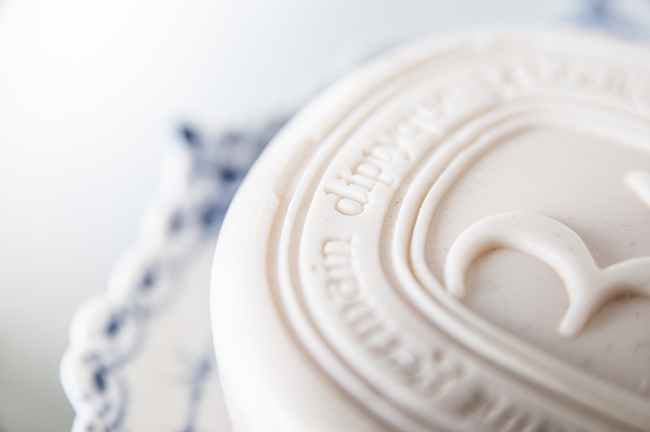 I love its creamy colour, thick lather and its lingering scent. 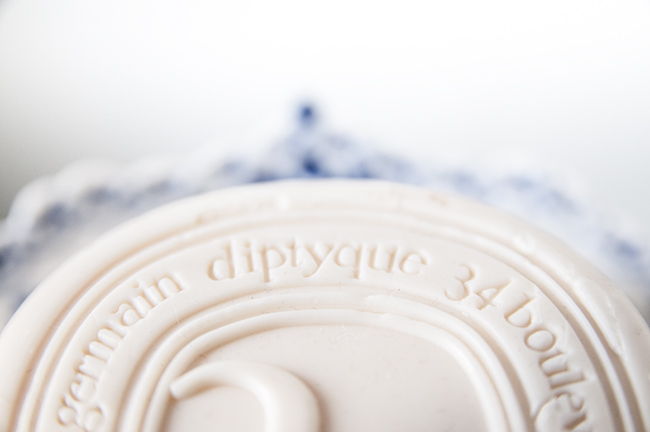 I also love the way it fills my home with its fragrance and the large bar lasts months. If you’re looking for a gift idea for a guy or a girl, it’s super affordable. I LOVE it!